This essay represents not only another effort to bury the ‘paranoid style,’ but also (especially for those opposing the interment) an attempt at least to review the term’s problematic origins and consequences. Certainly President Trump promotes groundless conspiracy theories and claims to be unfairly persecuted, dispositions shared by many of his supporters. The question at hand is whether the term ‘paranoid style’ enhances or inhibits understanding of Trump, his coalition, and his presidency. Hofstadter’s catch phrase and the initially serious ideas behind it fitted into three intersecting trends in the post-World War II era. First, with Cold War liberals leading the way, the right-center-left model became the prevailing framework for conceptualizing American politics by the early 1950s. This simple formula, which originated in the French Revolution, had been more-or-less standard in Western Europe for over a century. In this respect, as in many others, the United States was different. The conflict over slavery culminating in the Civil War produced a powerful North-South regional interpretation of American history. Then the Populist revolt of the late-nineteenth century strengthened an East-West regional interpretation that was codified in Frederick Jackson Turner’s frontier thesis. Charles Beard stressed instead the conflict between classes or economic groups. The Great Depression, World War II, and the early Cold War not only transformed domestic and international politics, but also changed the ways in which Americans conceptualized these developments. President Franklin Roosevelt eschewed ‘radical’ and ‘progressive’ to claim the label ‘liberal’ for the New Deal welfare state. In practice, the famous Roosevelt coalition changed several times before FDR’s death in 1945. Many ‘old progressives,’ judging the New Deal too coercive and disruptive of social order, reluctantly began to call themselves conservatives. In 1940-41, some conservatives who favored aid to the Allies replaced anti-war liberals who defected from the Roosevelt coalition. During the on again, off again Popular Front phases from the mid-1930s to the late-1940s, Communists and their allies continued to portray ‘the people’ arrayed against the ‘interests’ (now often characterized as ‘fascist’). Neither classic Marxism nor liberal notions of rational self-interest adequately explained Italian Fascism or German Nazism let alone fascism as a generic category. During the 1930s, anti-Communist liberals began to emphasize similarities between Nazi and Soviet ‘totalitarianism.’ This trend accelerated as the Cold War escalated in the late-1940s. As Cold War liberal Arthur Schlesinger, Jr. wrote, domestic and international developments required a revised “terminology of politics.” The “linear conception of right and left”—the interests versus the people—no longer fitted reality. Schlesinger’s The Vital Center: The Politics of Freedom, published in 1949, was especially influential in popularizing the revised terminology. In the right-center-left model, wisdom and virtue resided in a practical center dominated by Cold War liberals occasionally aided by some sensible conservatives. The far left and far right met “at last on the murky grounds of tyranny and terror.” This soon-to-be-standard framework was applied not only to Nazi Germany and the Soviet Union but also to the American far right and far left. In a second, related post-World War II trend, self-consciously “pluralist” intellectuals like Hofstadter, Daniel Bell, Seymour Martin Lipset, Nathan Glazer, and David Riesman tried to make sense of what they called “radical right” movements associated with Senator Joseph McCarthy in the 1950s and with Senator Barry Goldwater and the John Birch Society in the 1960s. Their efforts reached beyond the academy with a collection of essays called The New American Right, edited by Bell in 1955, which the contributors modified into The Radical Right: The New American Right, Expanded and Updated in 1963. Third, in the three decades after World War II social science perspectives in general and psychological interpretations in particular were increasingly applied to a wide range of issues. Indeed, from the 1940s through the 1960s, psychology was an almost inescapable part of the Zeitgeist. Influential pre-World War II antecedents of this development included scholars at elite universities who probed ‘culture and personality,’ Frankfurt School émigrés who tried to combine Marxism and psychoanalysis, and pop Freudians who published guides to winning friends and selling real estate. The foremost postwar intellectual products were variously admirable, brilliant, obtuse, and infuriating—sometimes all at the same time. The psychologizing trend crossed international boundaries. In Cold War America, psychology of a sort served primarily as an alternative to pre-war Marxist or Beardian economic interpretations that were considered clunky and/or subversive. The dominant voice was ‘neo-Freudian’ ego psychology, which usually stressed the possibility and desirably of social adjustment. Most neo-Freudians also drew a sharp distinction between normality and abnormality. In the same vein, Arthur Schlesinger maintained that the far left and far right appealed to men and women who, disoriented by modernity, fled freedom for totalitarian discipline. Yet the psychologizing trend extended beyond self-conscious advocates of political and temperamental moderation. The Supreme Court decision in Brown v Board of Education rested partly on the argument that segregation psychologically damaged black children. According to radical theorists Herbert Marcuse, Norman O. Brown, and Frantz Fanon, whole cultures, peoples, or even all of humanity could be in some sense mentally ill. This kind of grand theorizing crested in 1979 with The Culture of Narcissism by Hofstadter’s student Christopher Lasch. Practitioners and students of American foreign policy used a psychological perspective to legitimate the Cold War. George F. Kennan’s famous essay, “The Sources of Soviet Conduct,” was initially titled “Psychological Background of Soviet Foreign Policy.” By the 1960s, vital center liberals, with Schlesinger, in the lead, routinely pronounced the Cold War inevitable because Stalin was ‘paranoid.’ A skeptical William Appleman Williams suggested a retrospective psychoanalysis of Stalin by three psychologists he respected: Robert Coles, Rollo May, and Abraham Maslow. No historian took up Williams’s challenge and few even got the joke. The explorations begun by Hofstadter, Bell, Lipset, Glazer, Riesman, and their fellow pluralists had considerable merit. Many of the inherited ‘material’ interpretations of politics were clunky or had become formulaic. The revisionist essays published in The Radical Right and elsewhere contain valuable insights about individual social movements. The authors usually distinguished between most of the American conservative and far right movements on the one hand and European versions of fascism on the other. They also recognized the appeal of these movements to the American working class, an insight that has been found and lost and found and lost and found by liberals and radicals at least once per generation since the mid-1950s. Trump’s election has ushered in the latest stunned rediscovery. A right-center-left spectrum did not and does not necessarily require reflexive celebration of the center. Nor does it necessarily assume that these three positions are hermetically sealed off from one another. Unfortunately, Hofstadter, Bell, Lipset, Glazer, Riesman and their academic coterie tenaciously translated these prescriptions from Cold War liberalism into a social science idiom. With occasional exceptions, practical bargaining among interest groups was postulated as the norm within an American consensus. ‘Extremists’ on the far left and far right were said to depart from this centrist civility in three intertwined ways: their social position, psychological condition, and mode of political operation. To begin with, extremists on both ends of the spectrum were typically social outsiders—those whom Bell called the “dispossessed.” On the far right end, these outsiders included old families losing influence, Protestant fundamentalists also in decline, and ethnic groups still denied full acceptance—notably, the Irish-Catholics who celebrated McCarthy. Despite obvious differences, elite WASPS, theologically conservative Protestants, and unmelted ethnics were all motivated by “status anxiety.” There was no discussion of religious beliefs or practices. On the contrary, “fundamentalism” not only encompassed traditionalist Catholics as well as Protestants, but was also widened to include a generic “fundamentalist” frame of mind. Moreover, far right extremists differed psychologically from centrists, a category expanded to embrace prudently dull conservatives like President Dwight D. Eisenhower. They were really “pseudo-conservatives.” In the worst cases, as Lipset wrote, their “apocalyptic and aggressive” outlook revealed “paranoid tendencies.” The term “pseudo-conservative” was borrowed from The Authoritarian Personality, a massive study of prejudice whose lead author was Frankfurt School émigré Theodor Adorno. But the Frankfurt School was insufficiently Americanized to have had much impact on The Radical Right. Insofar as the authors adhered to a coherent psychological perspective, it was a pop version of neo-Freudian adjustment. Finally, the “radical right” shunned practical politics which Bell characterized as “ad-hoc compromise and day to day patching.” The practical deals made by mayors, state legislators, and members of Congress involved material interests. Pseudo-conservatives engaged instead in various kinds of impractical “status politics.” For example, their resentment prompted attacks on elites. As Hofstadter put it, pseudo-conservatives, unsure of their social standing, focused their anti-Communist zeal on Ivy Leaguers Franklin Roosevelt and Dean Acheson instead of Julius and Ethel Rosenberg, their fellow “bedraggled” extremists at the other end of the spectrum. Furthermore, pseudo-conservatives brought into the public square issues of belief and behavior—notably, those relating to religion—that should be kept in the personal sphere. Above all, radical rightists adhered to bizarre conspiracy theories. Some Birchers considered President Eisenhower a conscious agent of the Communist conspiracy. Others further right accused an international Jewish cabal, perhaps revealed in The Protocols of the Learned Elders of Zion, of using both capitalism and Communism to undermine Christian civilization. The pluralists applied their model retrospectively to most of American history. Antecedents of the post-World War II radical right included radio priest Charles Coughlin, the premier anti-Semitic conspiracy theorist of the late 1930s; the Ku Klux Klan of the 1920s; the agrarian rebels of the late nineteenth century who were mobilized into the People’s party during the 1890s; the anti-Catholic American (or Know-Nothing) party of the 1850s; the Anti-Masonic party of the 1820s and 1830s; and segments of the Federalist party in the 1790s. The People’s party played a crucial role in this genetic history. Particularly susceptible to farfetched conspiracy theories in general and the anti-Semitic variants in particular, the Populists were precursors of the twentieth-century Coughlinites, McCarthyites, Birchers, and Goldwaterites. Senator Robert La Follette appeared as the link between the Populists and McCarthy in Wisconsin politics. More important than their lapses into snobbish cosmopolitan, Hofstadter, Bell, Lipset, Glazer, Riesman, and their coterie disliked not only (upper case) Populism as a nineteenth century political party, but also (lower case) populism—any angry movements assailing ostensibly responsible elites. Their claim that practical bargaining within a consensus was the American norm looks at first glance like the product of innovative scholarship. It was at least as much a secular prayer that this was the case. Well-researched critiques kept on coming. The Populists in the 1890s were no more anti-Semitic than most of their contemporaries and perhaps less so than the New England Brahmin elite; they were considerably more hospitable than their Republican rivals to the large Roman Catholic population on the prairie. The post-World War II Red Scare usually mislabeled McCarthyism had sturdy roots in President Harry S Truman’s apocalyptic Cold War rhetoric and government loyalty-security program. Insofar as group electoral support could be measured across many decades, McCarthy voters in Wisconsin were not the heirs of the Populists or La Follette. Theologically conservative Protestantism was not dying out in the 1950s and 1960s. Rather, with some adaptations in style and doctrine, evangelicals flocked to hear Billy Graham in stadiums a few miles from Columbia University where Hofstadter and Bell taught. The Anti-Masonic and Know-Nothing parties had considerably more support from established politicians than the pluralists occasionally conceded. The presentation of the Ku Klux Klan as an “extremist” movement is particularly instructive for scholars who expect sophisticated theory always to enhance understanding. As the best workaday journalists of the 1920s had reported, the Klan was an integral part of American life from the stage to the sports pages to the early radio airwaves. Although the conceptual and empirical challenges never ceased, the impact beyond academic specialists was slight. The pluralists not only held onto their model, but also added new trouble makers like George Wallace. Outside the academy, Populism and populism never recovered from the pluralist hatchet job. Commentators—including some historians who should know better—still routinely present essentially admirable and relatively tolerant figures like William Jennings Bryan and Huey Long as Trump’s precursors. On the international scene, the label populist was quickly applied to right-wing leaders Nigel Farage in the United Kingdom, Marine Le Pen in France, Geert Wilders in the Netherlands, Viktor Orban in Hungary, and Jaroslaw Kaczynski in Poland. The ease with which European commentators borrowed the negative conception of populism from their American counterparts is striking. After all, a different connotation was on display nearby in the moderate Austrian People’s party and Spanish Popular party. To the best of my knowledge, no one has ever seriously run for office under the banner of the Unpopular party. Many liberal and radical attacks on Goldwater and his followers reorchestrated the exaggerated Depression era fear of American fascism happening here (as Sinclair Lewis had famously warned in his 1935 novel, It Can’t Happen Here). California Governor Edmund G. Brown, AFL-CIO President George Meany, civil rights leader, Martin Luther King, Jr., and Protestant social gospelers at Christian Century heard echoes of fascism or Nazism in Goldwater’s grassroots mobilization. Hundreds of psychologists and psychiatrists who had never met Goldwater diagnosed him as mentally unfit for the office. In this emotional context, the essays added to The Radical Right in 1963 were less exploratory than those published in The New American Right eight years earlier. Perhaps the fresh assertiveness, sometimes to the point of dogmatism, also reflected the rise of the authors to eminence in American intellectual life. Among the leading pluralist theorists of “extremism,” Hofstadter was always the most interested in psychological explanations. He began working on what became “The Paranoid Style in American Politics” in 1963. The final version appeared as the lead article in a collection published in 1965. The Paranoid Style in American Politics and Other Essays also reprinted slightly modified versions of his contributions to The Radical Right along with a piece on the Goldwater campaign. Pleased by the Republican nominee’s overwhelming defeat, Hofstadter more-or-less returned to his customary cool tone. These four articles in Paranoid Style must be analyzed together. Furthermore, we need to recognize the quirks and tricks—which Hofstadter would not have acknowledged as tricks—that characterized most of his writing. His chief quirk was an infatuation with ambiguity and paradox even beyond the de facto requirements of cosmopolitan intellectual life in his generation. Readers may search in vain for a straight linear sentence—at least a straight linear sentence whose conclusion is not hedged by caveats a paragraph or two down the way. Hofstadter’s chief trick was to obscure methodological or empirical weaknesses with fluent exposition, coercive adjectives, adverbs, and nouns, and catchy turns of phrase. Much of the behavior he liked to call “curious”—his premier coercive adjective, also favored in adverb form—was curious only in the eye of the beholder: Hofstadter himself. In a nutshell, not only were there conspiracies within history, which was certainly true, but “History is a conspiracy.” Events constantly verged on an apocalyptic “turning point.” Under the circumstances, paranoid stylists did not see “social conflict as something to be mediated in the manner of the working politician.” At first glance, paranoid stylists left and right seemed to use evidence like everybody else though often with a “pedantry” bred of insecurity. At a certain point, however, they made a “curious leap of imagination” into fantasy. ‘Paranoid style’ was primarily a catch phrase from the start. The major arguments and examples in Hofstadter’s title essay had been disseminated by his pluralist coterie for a decade; there had been casual references to ‘paranoia’ in The New American Right. But Hofstadter’s title and the long essay that followed made a difference. Now relegated to a clinical-sounding category, far right extremists seemed more peculiar than ever. As usual, too, Hofstadter’s catchy phrases, paradoxes, and caveats revealed weaknesses in his arguments. Most obviously, if “paranoid” was not being used “in a clinical sense,” why use the word at all? Hofstadter called “imitation of the enemy” a “fundamental paradox” of the style. Like their moderate opponents, extremists in every era recruited turncoats and prodigiously documented their own beliefs. Yet what is surprising about adversaries living in the same country at the same time drawing on a common store of themes and tactics? Most important, Hofstadter’s caveats included numerous established figures that led or belonged to extremist coalitions. The list ranged from Jedidiah Morse, Samuel F. B. Morse and Lyman Beecher in the nineteenth century to McCarthy and Goldwater in the twentieth. Others cited by Hofstadter, including the White Citizens Councils, aficionados of Kennedy assassination plots, and Joseph Stalin, did not fit his core criterion of considering history itself as a conspiracy. Despite his own evidence, Hofstadter could not bring himself to acknowledge the fluidity of the psychological or political spectrum. This sharp dichotomy was an unacknowledged and perhaps unrecognized inheritance from the pre-World War II ‘materialist’ interpretations Hofstadter judged inadequate. Beardians emphasized economic interests at the expense of ideas and most Marxists distinguished the powerful economic base from the ephemeral superstructure. The problem in all three cases was that, with the exception of clunky social theorists, most people do not rigidly compartmentalize their thoughts and feelings this way. Most Americans always wanted more stuff but they did not regard their cultural and psychological needs as luxuries. Their sense of self was often—though not always—connected to how much stuff they owned. Psychological and cultural needs varied from group to group and from era to era. Frequently, however, these feelings were embedded in the general American language: pursuit of happiness, republican virtue, honor, character, manliness, true womanhood, producer, worker, middle class, and identity (the last popularized by neo-Freudian ego psychologists). Or, as we used to say in the northern New Jersey discourse of my youth, nobody wants to be treated like crap. Although Hofstadter and his pluralist coterie wanted to exclude so-called psychological appeals from politics, the real question is what mix of economic and cultural appeals is effective and (ideally) ethical. Reinhold Niebuhr and Kenneth Burke pondered this question over and over during the Great Depression. Also during the 1930s, leaders in the struggle for labor unionization, the last mass movement Hofstadter and his fellow pluralists admired, skillfully combined economic and cultural appeals. The New Deal under Roosevelt was an obvious psychological success among most Americans. So was Eisenhower’s use of his grandfatherly persona to calm the country. In different ways, both presidents showed that cultural conflicts were also susceptible to trade-offs and compromises (though at a social cost, especially for African-Americans, and not without continuing controversy). As a historian, Hofstadter had always been more interested in American Christianity than the sociologists Bell, Lipset, Glazer, and Riesman. By 1965 he had discovered that theologically conservative Protestantism was not declining after all. Rather, what he mischaracterized as the “re-emergence of fundamentalism in politics” looked like a powerful source of “Manichean and apocalyptic” thinking. “Of necessity,” Hofstadter wrote with one of his coercive nouns, he used fundamentalism in a “rather extended way to describe a religious style.” Nothing was less necessary. The evangelical and fundamentalist parts of the religious revival begun during World War II needed instead to be sorted out. Hofstadter paid even less attention to actual religious beliefs and practices than he had when writing about the first and second Great Awakenings in Anti-Intellectualism in American Life. The fifteen years after the publication of Paranoid Style produced changes in American political and intellectual life that Hofstadter (who died in 1970) might have pronounced curious but which were unsurprising. Growing doubts about the Vietnam War reopened other questions that had been dormant or suppressed since the 1920s. The right-center-left spectrum temporarily widened (by American standards) on both ends. The personal became the publicly political for the foreseeable future. One of the reopened questions involved the nature of normality itself. Diverse psychologists and psychiatrists rejected the sharp distinction between normal and abnormal behavior as well as the alleged virtues of adjustment. Once again the trend crossed international borders. For example, Robert Coles wryly recanted his earlier belief that through “some combination of ten years of psychoanalysis and a little liberal juggling of the economy . . . by golly heaven would be right around the corner.” R.D. Laing, a leader of the British anti-psychiatry movement, came close to saying that in a murderous world the crazy people were really the sane people. In book after book libertarian Thomas Szasz derided the “myth of mental illness.” States of mind labeled schizophrenia or paranoia were not diseases like cancer or congestive heart failure. Rather, Szasz contended, most of his fellow psychiatrists used medical-sounding jargon to “boot leg” moral values. They legitimated their own social or political judgments while stigmatizing and controlling those who disagreed in odd ways. The dissident psychiatrists and psychologists differed among themselves and their works contained dubious claims as well as valuable ideas. Yet collectively they reaffirmed the continuum between normality and abnormality that marked the worldviews of both Freud and William James, the first great humanist psychologist. In 1973, the American Psychiatric Association put the “Goldwater rule” into its code of ethics; the rule warned members against publicly diagnosing anyone they had not examined. As the polarized Sixties temporarily widened the right-center-left spectrum, Bell, Lipset, Glazer, and many other vital center intellectuals, distressed by domestic and international disorder and criticism of Cold War orthodoxy, moved rightward. Some of them reluctantly accepted the label neoconservative. Their reductionist psychological interpretations now focused on ‘paranoid’ left-wing ‘extremists,’ too many of whom seemed to occupy their own classrooms. In 1980, Bell and Lipset became part of Ronald Reagan’s coalition along with Barry Goldwater and millions of Protestant evangelicals they never understood. Cheap irony aside—sorry, I couldn’t resist—“paranoid style in American politics” deteriorated from a term of art with some theoretical and empirical basis into an unexamined catch phrase. Nor does my rejection of ‘paranoid style’ preclude occasional acts of blowing off steam. In the northern New Jersey discourse of my youth, President Trump is a stuck-up bigot, bully, blowhard, and con man. Leo P. Ribuffo, Society of the Cincinnati George Washington Distinguished Professor of History at George Washington University is author of The Protestant Far Right from the Great Depression to the Cold War (Philadelphia: Temple University Press, 1983) and Right Center Left: Essays in American History (New Brunswick: Rutgers University Press, 1992). He is writing a history of the Carter presidency in broad social and cultural context. Chuck McCutcheon, “In assessing Donald Trump’s appeal, some go to the phrase ‘paranoid style’,” Christian Science Monitor, 14 December 2015. Conor Lynch, “Paranoid Politics: Donald Trump’s style embodies the theories of a renowned historian,” Salon, 7 July 2016. Thomas G. Edsall, “The Paranoid Style in American Politics is back,” New York Times, 8 September 2016. Paul Musgrave, “Donald Trump is Normalizing Paranoia and Conspiracy Thinking in U. S. Politics,” Washington Post, 12 January 2017. Jonathan S. Tobin, “The Paranoid Style in Anti-Trump Politics,” National Review, 12 February 2017. References to Hofstadter and the paranoid style also marked the Organization of American Historians session on Trump in April 2017. Arthur M. Schlesinger, Jr., The Vital Center: The Politics of Freedom ( Boston: Houghton Mifflin, 1962), 143-144. Schlesinger, Vital Center, xxiii-xxiv. Historians have paid little attention to the controversy over conceptualizing the political spectrum but see Alonzo L. Hamby, Beyond the New Deal: Harry S. Truman and American Liberalism (New York: Columbia University Press,1973), 277-284, Edward A. Purcell, Jr., The Crisis of Democratic Theory: Scientific Naturalism and the Problem of Value (Lexington: University Press of Kentucky, 1973), 235-272, and David Green, The Language of Politics in America (Ithaca: Cornell University Press, 1987), especially 119-206. Daniel Bell, ed., The Radical Right: The New American Right, Expanded and Updated (New York: Doubleday, 1963). The other contributors to this volume, less original or less central to the main themes discussed here, were law professor Alan Westin, idiosyncratic conservative historian Peter Viereck, and sociologists Talcott Parsons and Herbert Hyman. Schlesinger, Vital Center, 52, 54, 58. Russell Jacoby, Social Amnesia: A Critique of Contemporary Psychology from Adler to Laing (Boston: Beacon Press, 1975) offers a spirited critique of neo-Freudianism and related “humanist” psychology from the perspective of a strict Freudian on the political left. There was more intellectual cross fertilization among the contending psychological and psychoanalytic schools of thought than contemporary and subsequent polemics suggest. Norman O. Brown, Life against Death: The Psychoanalytical Meaning of History (New York: Vintage, 1959), Herbert Marcuse, An Essay on Liberation (Boston: Beacon, 1969). Frantz Fanon, The Wretched of the Earth  New York: Grove, 2004), Christopher Lasch, The Culture of Narcissism: American Life in an Age of Diminishing Expectations (New York: W.W. Norton, 1979). John Lewis Gaddis, George F. Kennan: An American Life (New York: Penguin, 2011), 259, Arthur M. Schlesinger, Jr., The Cycles of American History (Boston: Houghton Mifflin, 1986), 189-190. William Appleman Williams, History as a Way of Learning (New York: New Viewpoints, 1973) 371. Williams’s invocation of Coles, May, and Maslow shows that neo-Freudian and humanist psychological theories need not support the status quo. So does Betty Friedan’s enlistment of Maslow in the cause of women’s liberation in The Feminine Mystique. Richard Hofstadter, The Paranoid Style in American Politics and Other Essays (New York: Vintage, 1967), ix-x. Let me emphasize that I do not consider the writings of Turner and Beard to be clunky. In particular, Beard’s discussion of “relativism” and his controversial books on FDR’s foreign policy deserve renewed attention. For the first post-World War II discovery of the angry white working class, see, in addition to The New American Right, Seymour Martin Lipset, “Working-class Authoritarianism,” in Lipset, Political Man: The Social Bases of Politics (New York: Anchor, 1963), 87-126. Bell, Radical Right, 314. On the degree to which the Frankfurt School was Americanized with particular reference to The Authoritarian Personality and other books in the Studies in Prejudice Series, see Martin Jay, The Dialectical Imagination: A History of the Frankfurt School and the Institute for Social Research, 1923-1950 (Boston: Little, Brown, 1973), 219-252, Thomas Wheatland, The Frankfurt School in Exile (Minneapolis: University of Minnesota Press, 2009), 219-257 and Stuart Jeffries, Grand Hotel Abyss: The Lives of the Frankfurt School (London: Verso, 2016), 274-279. Seymour Martin Lipset and Earl Raab, The Politics of Unreason: Right-Wing Extremism in America, 1790-1970 (New York: Harper and Row, 1970). Hofstadter explored many of these themes in two books preceding Paranoid Style, The Age of Reform: From Bryan to FDR (New York: Vintage, 1960) and Anti-Intellectualism in American Life (New York: Vintage, 1963). C. Vann Woodward, “The Populist Heritage and the Intellectual,” in Woodward, The Burden of Southern History (Baton Rouge: Louisiana State University Press, 2008), 141-166; David S. Brown, Richard Hofstadter: An Intellectual Biography (Chicago: University of Chicago Press, 2006), 116-119; Bell, Radical Right, 92, 96. The critical scholarly literature is too large even to begin to summarize here. Since the case of the 1920s Klan is especially instructive, however, see Felix Harcourt, Ku Klux Kulture: America and the Klan in the 1920s (Chicago: University of Chicago Press, forthcoming fall 2017). On the lazy application of “populism,” especially by journalists, see Charles Postel, “If Trump and Sanders Are Both Populists, What Does Populism Mean?” The American Historian, January 2016, available at tah.oah.org/february-2016. Postel’s The Populist Vision (New York: Oxford University Press, 2007) is the most important recent study the People’s party of the 1890s. Robert Alan Goldberg, Barry Goldwater (New Haven: Yale University Press, 1995), 149-237, 331-332. Brown, Richard Hofstadter, 157. 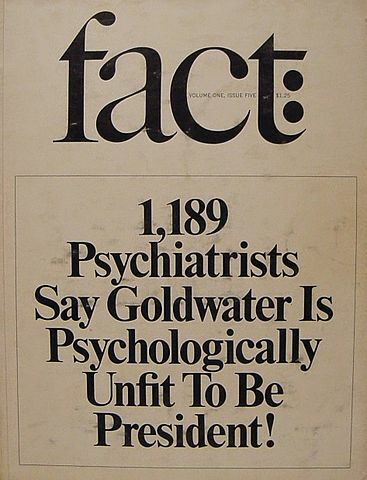 The most prominent attack on Goldwater by psychologists and psychiatrists was organized by Fact magazine; while some of the respondents used clinical terms like “paranoid schizophrenic,” others stuck to vernacular expressions like “warped.” Goldwater sued Fact for libel and won a judgment of $150,000 in 1968. For the Fact controversy, see Goldberg, Barry Goldwater, 390, Evan Osnos, “Endgames,” New Yorker, 8 May 2017, 39, and Lionel Lokos, Hysteria 1964: The Fear Campaign Against Barry Goldwater (New Rochelle: Arlington House, 1967) 140-144. Hysteria 1964 is a convenient compendium of attacks on Goldwater compiled by an outraged supporter and blurbed by the Senator himself. Despite the allusions to fascism and Nazism cited here, much of the anthologized criticism still looks sensible. Anyone interested in my long- standing skepticism of recurrent American fascism scares should consult Leo P. Ribuffo, The Old Christian Right: The Protestant Far Right from the Great Depression to the Cold War (Philadelphia: Temple University Press, 1983) and “It Can’t Happen Here: Novel, Federal Theatre Production, and (Almost) Movie” in Ribuffo, Right Center Left: Essays in American History (New Brunswick: Rutgers University Press, 1992), 161-188. Younger scholars may say that I am “interrogating” Hofstadter’s arguments but since that term reminds me of a Depression era film noir with Jimmy Cagney, I’ll stick with analyzing. Hofstadter, Paranoid Style, 3-4, 14. Hofstadter, Paranoid Style, 14, 29, 35-36, 39. Hofstadter, Paranoid Style, 126-131, 139. Hofstadter, Paranoid Style, 52, 67, 86-87. Hofstadter, Paranoid Style, 72-73, italics added. Hofstadter, Paranoid Style, 65, 89-90. For an excellent overview of the shifting Zeitgeist from the 1950s to roughly 1980, see Edward A. Purcell, Jr., “Social Thought,” American Quarterly 35 (Spring-Summer 1983), 80-100. To further explore this trend, see R. D. Laing, The Politics of Experience (New York: Pantheon, 1967); Thomas Szasz, The Myth of Mental Illness: Foundations of a Theory of Personal Conduct (New York: HarperCollins, 1974), and Ideology and Insanity: Essays on the Psychiatric Dehumanization of Man (Syracuse: Syracuse University Press, 1991); and Robert Boyers, ed., R. D. Laing and Anti-Psychiatry (New York: Perennial, 1971). Szasz’s work has many virtues but he slights the metabolic sources and pharmacological treatments of mental disorders. Coles is quoted in Boyers, 221. David Brion Davis, ed., The Fear of Conspiracy: Images of Un-American Subversion from the Revolution to the Present (Ithaca: Cornell University Press, 1971), xiii-xiv. John Ehrman, The Rise of Neoconservatism: Intellectuals and Foreign Policy (New Haven: Yale University Press, 1995) remains the best account of the vital centrist transition to neoconservatism. Ehrman rightly sees the term as problematic even in its heyday. So does reluctant neoconservative Seymour Martin Lipset in American Exceptionalism: A Double-Edged Word (New York: W.W. Norton, 1996), 176-208. Speculation persists as to whether or not Hofstadter would have become a neocon and supported Reagan in 1980 if he had lived. See Brown, Richard Hofstadter, 87-89, 147-152. Beverly Gage, “Reading the Classic Novel that Predicted Trump,” New York Times, 17 January 2017; Douglas Perry, “Donald Trump a Fascist? The debate rages: expert claims ‘clock is ticking’ on U.S. democracy,” Oregonian, 3 May 2017; “The Goldwater Rule,” New Yorker, 22 May 2017, 28-30; “Goldwater rule in Trumpland: Psychiatrists debate weighing in on the president’s mental health,” www.salon.com/2017/02/18; “APA Remains Committed to Supporting Goldwater Rule,” www.psychiatry.org/news-room/apa-blogs/apa-blog/2917/03. Leo P. Ribuffo, “The Forebears of Trumpism,” History News Network, 17 September 2015, is available at historynewsnetwork.org/article/160552. This essay, though dated in some respects, basically shows what I still think about the man and his movement. I place Trump in the contexts of American nativism, Republican conservatism since the 1930s, politics as entertainment, and know-it-all billionaires. While historians have moved away from psychological interpretations of behavior, Robert Shiller and other economists have rediscovered them. Among non-academics eager to win friends or sell real estate, pop psychology has never died.